The low snow year has made the Tahoe biking trails accessible earlier than I can recall. All of the trails below 7,000 feet are clear of snow. The creeks are very low and the early season muddy sections are nearly dry as well. Car roof racks tell the story; People are rolling to Tahoe with their mountain bikes. Northstar ski resort will open their mountain bike park early this year, June 7, 2013. Northstar has a gondola and two ski lifts (Tahoe Zephyr and Vista Express) to get you up the mountain for a fee. You are welcome to pedal up the mountain for free if you prefer. Either way, there are miles of cross country and downhill courses to enjoy. 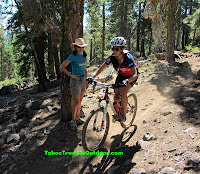 There are miles of trails in the area of Northstar/Truckee that beg to be ridden. Sawtooth Ridge Trail and connecting trails that go over to Tahoe City. Emigrant Memorial Trail. An intermediate trail that is a 30 mile out-and-back to Stampede Reservoir. Western States Trail. An intermediate trail that goes from the back side of Northstar, through Squaw Valley and on to Auburn. Coldstream Canyon. Miles of jeep trails, railroad roads, and JP’s single-track. Tahoe Rim Trail. Passes near the back side of Northstar. Travel towards Martis Peak or Tahoe City. 1. Carry tools to fix a flat. Use tubeless tires and you won’t flat. 2. When descending steep hills, keep your weight as far back as possible. 3. When climbing steep hills, sit on the nose of the saddle to keep your weight forward. 4. Look ahead when riding. Staring down at your wheel or fixating on an obstacle will make you hit that obstacle. 5. Carry speed and/or apply pedal pressure over obstacles. Otherwise, the wheel stops and you keep going forward. 7. Tell someone where your route and when you will return. 8. Check tire pressure in tires and shocks. 9. Carry plenty of food and water. 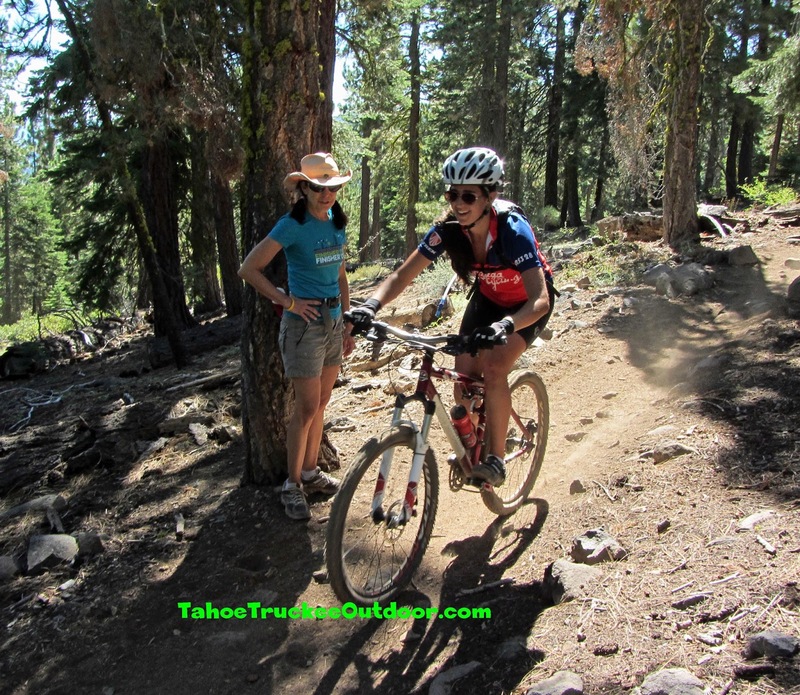 The low snow year has made the Tahoe biking trails available sooner than I can review. The greater part of the trails underneath 7,000 feet are clear of snow. The rivulets are low and the early season sloppy segments are about dry also. The creeks are very low and the early season muddy sections are nearly dry as well. Car roof racks tell the story; People are rolling to Tahoe with their mountain bikes.